Biodegradable Superabsorbent Materials Market size was more than 52 Kilo tons in 2015, growing at over 6.1% CAGR up to 2023. Global biodegradable polymers market size was over 400 kilo tons in 2015 and is estimated to surpass 803 kilo tons by 2020, growing at more than CAGR of 12%. In revenue terms, the market is forecast to be worth over USD 3 Billion by 2020, increasing with estimated gains of 10% up to 2020. Rise in environment consciousness accompanied by need to reduce dependency on conventional sources are expected trending factors to favor global biodegradable superabsorbent materials market size. As per European Industry Starch Association, the global starch market was valued at over USD 56 billion in 2014, with estimated production output of over 70 million tons in the same year. China and Brazil are the major contributors with total increment of 10%; other countries have witnessed 1-2% annual growth. Abundant starch availability as feedstock is likely to provide an advantage for polysaccharide superabsorbent polymer market growth. Growing need for optimum resource utilization due to increasing population growth accompanied by urge to manage the industrial waste has led polymers industry to adopt eco-friendly resources. As the consumption is increasing, it is essential to ensure proper waste disposal, which should drive biodegradable superabsorbent materials market size. Environment damage coupled with lack of space to dump conventional materials has influenced manufacturers to use these eco-friendly products. These polymers are designed to absorb & retain large amounts of a liquid relative to their own mass. Personal disposable hygiene product, agriculture, and medical are major applications. Growing concerns among parents & women pertaining to health hazards related to baby diapers & sanitary napkins has alarmed consumers to prefer these biopolymers. Moreover, an infant until 30 months of age uses around six disposable diapers a day. Each diaper has an average volume approximately 500 cc, in conclusion one child produces around 3,000 cc garbage a day, which means 1,092 cubic meters annually, which should positively enhance biodegradable superabsorbent materials industry growth. World population is expected to surpass seven billion by 2050. High population growth and development of large high-density urban populations have put major pressures on environment, and threatening food security and environmental sustainability. The focus of today’s agriculture is to maximize land & water productivity without damaging environment and natural resources. Rising climatic variances, drought, insufficient precipitation distribution has led agriculture industry to adopt sustainable farming materials which may enhance biodegradable superabsorbent material market growth. Increasing crop water holding capacity, improved water use efficiency, enhancing soil permeability, reducing irrigation frequency & compaction tendency, stopping water & run-off erosion, enhancing plant performance particularly in drought potential land are major properties to boost product demand in agriculture sector. The production cost is high as the technology is still at a nascent stage. Fall in petroleum prices makes the biobased polymer comparatively higher and may affect biodegradable superabsorbent materials market price trend. Investment by Novozymes, Cargill and Metabolix to develop bio based acrylic acid may hamper biodegradable superabsorbents market size. The companies developing and commercializing bio based products may be eligible for carbon tax credits. This technology is relatively new to the consumers, appropriate guidelines and policies are required in the market in order to make the industry organized. Currently, regulations pertaining to advertising on bio products are not in action. Polyvinyl alcohol (PVA) dominates the current product landscape and was valued at over USD 82 million in 2015. It is a synthetic polymer used for myriad applications including polyvinyl butyral, glue thickeners, textile sizing and paper coatings preparation. Polyvinyl alcohol is widely used because of its solubility in water. It can be easily biodegraded by microorganisms as well as enzymes. Feminine hygiene and adult incontinence products are the major applications. Polysaccharides are set to witness maximum gains, at more than 9% CAGR up to 2023. Increasing environmental concerns regarding petroleum derived product degradability including polyacrylic acid and polyacrylamide is projected to drive biodegradable superabsorbent materials market size growth. Abundant polysaccharides availability such as starch, chitin, natural gums (alginates, xanthan & guar) and cellulose is another lucrative factor leverage product demand. Disposable diaper applications were worth over USD 79 million in 2015. Rising infant population growth accompanied by increase in consumer disposable income is among the key factor driving disposable diapers demand. Growing environmental consciousness among consumers and regulatory compliance to control municipal and industrial waste is potential factor to enhance industry growth. Agriculture application is projected to grow significantly at over 7% CAGR up to 2023. 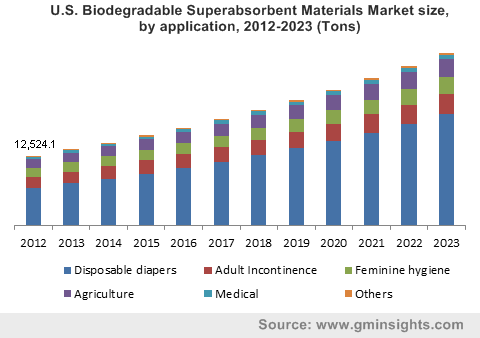 Limited water supply and presence of large arid areas are key potential reasons to enhance biodegradable superabsorbent materials market growth in this sector. As it possesses flocculation function to convert fine dust of soil to become loosed a big grain which is beneficial to prevent soil to be hardened. It also helps in reducing water depletion and improving plant growth and survival. Water retention and high absorbency is among the key properties to penetrate product demand in medical applications. Hydrogel made from collagen helps in absorbing exudates, improves healing process and prevent infection. Europe, led by Germany biodegradable superabsorbent polymer market size, dominated the regional industry and valued at over USD 48 million in 2015. Increasing consumer awareness for eco-friendly products mainly driven regional demand. Consumers in Germany, UK and France are ready to pay premium prices for products derived from biomass sources and are non-toxic. APAC is set to witness highest growth, increasing at more than 6.5% CAGR up to 2023. China dominated the regional demand may register over USD 25 million by 2023. High population growth accompanied by increase in consumer purchasing power is key factors driving regional industry growth. Global biodegradable superabsorbent materials market share is comprised of ADM, Exotech Bio Solutions, TryEco and Weyerhaeuser Company. Other notable companies Valagro, AMEREQ, Akron Biotech, CryoLife, Collagen Solutions, Coloplast A/S, and NanoChem Solutions. The industry may witness mergers & acquisitions and joint ventures with biotech companies over the foreseeable period owing to exchange of technologies and product portfolio expansion. Biodegradable superabsorbent polymer market finds applications in agriculture, medicine and personal hygiene products. Biodegradable polymers interest is increasing among manufacturers due to increasing inclination towards environmental friendly products. Synthetic or natural are the two biodegradable polymers groups. Polymers produced from petroleum resources feedstock are synthetic polymers and polymers from biological sources are natural polymers. PVA is a water-soluble synthetic polymer. It is both colorless and odorless in nature. It can be supplied as beads as well as solutions in water. Polyvinyl alcohol can be used as an emulsion polymerization and as protective colloid in order to make polyvinyl acetate dispersions. Feminine hygiene and adult incontinence are among the major applications in which polyvinyl alcohol is used as an absorbent. It is also used in adhesives, agriculture for emulsion polymerization, and seed coating. Polyvinyl alcohols are the majorly used superabsorbent polymers; comparatively less cost and more developed process are the key reasons for product growth. Increasing environmental awareness has encouraged industry participants to develop more sustainable and bio based superabsorbents. Polymers from natural resources such as protein, starch, and cellulose are increasing in demand. Polysaccharides, polyitaconic acid, and polypeptide are part of naturally resourced biodegradable superabsorbent polymer market. Polysaccharides are the fastest growing product segment due to the large raw material availability such as corn, potato, cassava, and cellulose. It is among the most suitable natural BioSAP market, owing to use in several industrial applications including personal hygiene, medical, and agriculture.